I am a graduate student in the Department of Physics at the University of Colorado. I have a wide variety of interests and hobbies, but foremost among them is the collection, cultivation and propagation of carnivorous plants. In particular, I specialize in the cultivation of tropical pitcher plants, known as Nepenthes. These plants are native to southeast Asia, including India, but a few species may also be found on the island of Madagascar, the Seychelles, and so forth. For purposes of cultivation, they are divided into two groups: those growing at elevations in excess of 3000 ft (914 meters), known as highland Nepenthes; and those growing at elevations below 3000 ft, referred to as lowland Nepenthes. The chief distinction between these two groups is the range of temperatures in their respective environments. Temperatures for low-landers are typically in the 70° to 95° F (21 to 35 C) range, while high-landers experience temps generally ranging from 50° to 85° F (10 to 29 C). In order to accommodate the different climatic needs of these two groups, I maintain two separate growing environments for my plants. For lowland Nepenthes, I have an outdoor greenhouse which is heavily humidified since I live in rather a dry climate. For cold winter nights, heat is provided by a gas heater which has enabled my green friends to endure nighttime lows of -17° F (-27 C) outside, while inside temps rarely go below 68° F (20 C). Highland Nepenthes are grown in a specially constructed chamber, roughly 80 feet square (7.4 m2), and a bit over six feet (1.8 m) in height. It is illuminated by a 1000 W HID (high intensity discharge) lamp, with a 14 hour photoperiod, and is also heavily humidified. Since I have been contacted by others interested in the design and construction details of this chamber, I intend to put more information about it online in the near future. In the meantime, if you have questions, feel free to send me email. The pictures below are from my personal Nepenthes collection. 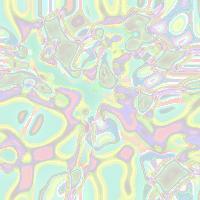 I intend to change the pictures periodically, so I invite you to return at a later time to view new photographs. This is a lower pitcher of Nepenthes thorellii, a fine species from Vietnam. It is a very easy grower in the lowland house, and seems to like alot of sun. Upper pitchers are sans wings, and yellow with red blotches. I have heard that this plant may have a dry season in its habitat, but I have had no problems growing it for several years with daily watering. If anyone growing this plant would care to comment on this, please email me. This gem is one of my favorite plants: Nepenthes rafflesiana. It is a very large variety, with lower pitchers ranging from 9 to 11 inches in height, and uppers to nearly 14 inches. A very easy and vigorous plant, it has grown almost 6 feet in about 14 months. 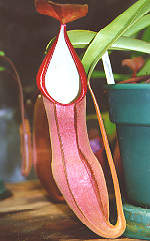 This is a photo of an upper pitcher from the same N. rafflesiana. As you can see, it is nearly as long as my wife's forearm, and is quite a lovely specimen. But then, my wife's forearm isn't bad, either. Personally, I think that one of the most beautiful of all Nepenthes is N. sanguinea. The contrast of the creamy white interior with the glossy red peristome is really quite striking, in my humble opinion. This jewel grows quite readily in my highland growing chamber, where it continues to produce nine to ten inch pitchers like this one. Although not terribly fast growing, it produces about ten leaves and pitchers per year. Although rather a common plant, I thought this pitcher of N. ventricosa too beautiful not to share. 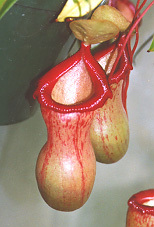 Its lovely reddish hues are best seen in pitchers lower on the vine. For some reason, pitchers higher up the vine are predominantly yellow. Last, but not least, we have N. veitchii(lowland). Pitchers and leaves are hirsute, being covered in a sparse, soft brown fuzz. Since this plant has adapted to clamber right up tree trunks in its environment, its leaves tend to curl around in an interesting way as they mature. It, too, is slow, but its lovely, broad yellow peristome is certainly enough reward for the patient grower. Since April 4, 1996, you are visitor number 3398. Carnivorous Plant Database This marvellous site, maintained by ICPS President Rick Walker, contains a wealth of information for CP growers everywhere! Carnivorous Plant Archive Server List server archives, CP FAQ, where to get plants, and more! Andreas Wistuba's CP page Here you will find a variety of pictures and other information about CP, particularly Nepenthes. Tom Hayes' CP page Tom has a very nice page with great photos and other information about CP in general. Dean Cook's page Dean sells and trades alot of plants. Great Sarracenias! California Carnivores If you haven't visited them in person, you're missing out. The web can give you a taste. Barry Meyers-Rice Barry's pages are loaded with info about CP, as well as other interesting things. Johannes Marabini's Nepenthes page Photos and tips from a master Nepenthes grower. Please don't take offense if I haven't listed your page. This is just a smattering of what is out there.